As part of the overall scheme to upgrade the existing lock structure and create impounded water at the inner harbour (circa 1881) Dew Piling Ltd were employed to design and install a temporary structure to allow new lock gates to be fitted in dry conditions. Despite a 7m tidal range from the Firth of Forth and an existing concrete base within the lock which could not be damaged Dew took on the challenge of providing a solution other than a conventional driven sheet piled cofferdam. After weeks of detailed design calculations and scrutiny of expected tidal conditions the sheet piles and extensive temporary propping totalling 120t were transported from Dew stockyard in Oldham to the site where the sheet piles were driven through approx 6m of silt with a high frequency vibro hammer to rest on the existing concrete base. Once the 2 lines were installed across the lock extensive welded steel propping was fixed by Dew welders in a very stringent sequence to allow the tidal forces to be equalised by internal water and silt pressures until the frames were completely welded and tested and the full loading could be applied. 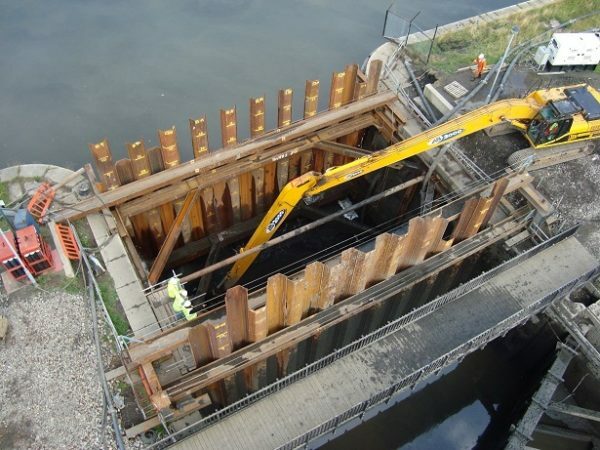 Over a period of weeks in tidal shifts the cofferdam was fully propped and cleaned of silt and the bracing partially removed when the new 2m deep concrete base was cast in situ. The new lock gates were fitted and Dew returned to remove all temporary piles and bracing before the seasonal wildlife arrived for the breeding season.